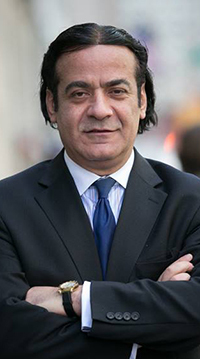 Ziad K. Abdelnour is a Wall Street financier, author, philanthropist, activist, lobbyist, oil & gas trader & president & CEO of Blackhawk Partners, Inc., a New York based-private equity “family office” that focuses on originating, structuring, advising and acting as equity investor in management-led buyouts, strategic minority equity investments, equity private placements, consolidations, buildups, and growth capital financing in US based companies and projects and the trading of key physical commodities. Mr. Abdelnour is also Founder & Chairman of the Board of the Financial Policy Council; a 501 (c) (3) non-profit organization designed to give its select group of supporters the opportunity to have direct face-to-face dialogue with the nation’s quintessential powerbrokers and policymakers. Mr. Abdelnour serves on the Advisory board of DPG Investments, a recognized premier multi strategy global merchant banking, alternative investment, management and advisory firm. Q: Profound gratitude for kindly agreeing to this interview. We know you are a powerful writer, a social activist and a Wall Street financier? How will you assess the Donald Trump era and his economic policies? A: Donald Trump era is not over. Just starting and I believe he will be re-elected as our President again in 2020. So far his track record and achievements as a whole have been at large nothing but spectacular. I give him an A+. As long as Trump is in power, I believe the U.S. economy has plenty of runway left before the next recession & there’s a good chance the good times will keep rolling for another 4-5 years. Q: You have connections with the Chinese investment groups as well as wealthy individual investors from China. In your opinion, how much aggressive is Chinese economy? A: As China increases in economic might, and starts competing for resources, as it is already doing, we will hear more and more of this kind of portrayal. I would counsel caution and advise we look at history to help us make sense of what shall become the central power struggle that will define the 21st century. Anyone talking about China’s aggression ought to remember the Opium War, when Britain forced a destructive drug on the Chinese, and when they resisted, launched a military attack which ended with the acquisition of Hong Kong. Other Western powers and Japan have acted in similarly aggressive ways in order to gain chunks of China. Economic empires don’t simply rely on good will and mutual advantage of trade. The USA doesn’t have over 800 military bases, expensively maintained, from the goodness of her heart. Great powers rarely behave well or have to. China is no different. If anything it is more honest and less aggressive. The natural resources, and now land for food, of Africa has always been sought by outside powers. From Romans to colonial powers and now China. They are the first to do so without violence or threat of it. Afghanistan will be an interesting flash point. Bordering China, immensely rich in natural resources, unruly with America assuming proprietary rights. Q: We know about OBOR [One Belt One Road] doctrine of President Xi Jinping. Once implemented, what will be the advantages of the countries which would be under OBOR network? A: At first glance, it seems that all those involved should benefit. Chinese loans would kick start the construction of the infrastructure projects. Developing countries, in which the projects are built, would profit as transshipment points and from the development of new industries that could plug into international supply chains. Revenues from the resultant economic growth would then repay the Chinese loans, with interest. That all sounds rosy. That is, if the new infrastructure network is used. The mere existence of roads and ports does not ensure that trade will flourish. Certainly economic growth at either end of the network would help. But at the moment the economies of both China and Europe are slowing. Indeed, global economic activity is slowing except maybe for a few countries such as the U.S. If there is not enough trade to make the new infrastructure profitable, then the benefits from the “One Belt, One Road” initiative only flows in one direction: China. The operative word in the “One Belt, One Road” initiative’s financing is “loans.” Chinese loans may have laxer requirements and carry a lower interest rate than those of commercial banks. But they are loans. China expects them to be repaid. Plus, Chinese loans for infrastructure projects are often made with the understanding that the developing countries award construction contracts to Chinese companies. In short, China benefits from both the financing and construction of infrastructure projects, while developing countries must bear all of the financial risk. When trade is booming, that may not matter much. But when it is not, that should be a concern. In the past, many developing countries became heavily indebted as a result of infrastructure projects that fizzled. Lenders ultimately had to forgive many of their debts, recognizing that their borrowers could never repay them. China has forgiven some of its loans to developing countries too, about $3.9 billion in all. But that is a small fraction of the total debts that developing countries owe it. For example, in 2015 China cancelled $40 million in debt from Zimbabwe. But Zimbabwe still owes China over $1 billion. Moreover, at the time of China’s modest debt cancellation, Zimbabwe pledged that it would increase its use of the Chinese yuan in its foreign exchange reserves. To outside observers, it seemed that China had used its debt cancellation to achieve its larger foreign policy goals. The two railway cases are telling. China may believe that the thirst for low-interest loans in developing countries should make its “One Belt, One Road” initiative an easy sell. But the leaders of those countries, at least those among them who are observant, know that China’s domestic economy is slowing and that China is increasingly concerned about keeping its construction companies working. They also know what happened in places like Sri Lanka, Indonesia, and Thailand. That knowledge gives them leverage to negotiate better terms from China. If more developing countries do so, China’s “One Belt, One Road” initiative will be quite a bit tougher to realize. Q: China is prospering economically. But still, there are a huge number of Chinese populations living under acute poverty. Do you think such imbalances may cause mass revolt? Q: China is not a democracy. Policymakers of that country have already said democracy is not a ‘suitable’ system for them? Considering China’s huge economic prosperity, do you think, democracy is responsible for the poverty and economic struggle of the under-developed and developing countries? A: In a depraved way, yes. By trying to help poor people in developing countries, the rich world may actually be corrupting those nations’ governments and slowing their growth. Much of the over $200 billion hat the world’s most developed countries spent on official aid this year may not have ended up helping the poor. There has always been a strong economic and political argument for helping poor countries. In the mid-20th century, economists widely believed that the key to triggering growth — whether in an already well-off country or one hoping to get richer — was pumping money into a country’s factories, roads and other infrastructure. So in the hopes of spreading the Western model of democracy and market-based economies, the United States and Western European powers encouraged foreign aid to smaller and poorer countries that could fall under the influence of the Soviet Union and China. Bottom Line: Empirical research shows that the countries that receive less aid, tend to have higher growth — while those that receive more aid, have lower growth. Why? Well it has to do with how foreign money changes the relationship between a government and its people. Think of it this way: In order to have the funding to run a country, a government needs to collect taxes from its people. Since the people ultimately hold the purse strings, they have a certain amount of control over their government. If leaders don’t deliver the basic services they promise, the people have the power to cut them off. Pure and simple. Q: How do you see the future of Sino-US economic cooperation and prospect for the Chinese investors in investing in the US? A: China in the past few decades has emerged as the world’s largest exporter and the United States’ second-largest trading partner after Canada. Despite being a relatively poor developing country, China has built up the largest trade surpluses in human history, creating economic problems for the United States. Trade with China has led to the loss of American manufacturing jobs, reduced real wages for semiskilled workers, and devastated some communities dependent on low-end manufacturing jobs. These negative effects have naturally given rise to protectionist sentiments in the U.S. presidential campaign and given trade in general a bad name. While protectionism is tempting, it is almost certain to backfire and cause more economic harm to the United States. Inducing China to become a more normal trading and investing nation will require a mix of carrots and sticks from the next administration, a policy that could be characterized as “responsible hardball.” As a departure from current policy, the most promising option would be imposing new restrictions on Chinese state enterprises purchasing their competitors in the United States until China opens up reciprocally. The United States can also use leverage over China’s desire to be granted market economy status in order to negotiate significant reductions in excess capacity in steel and other heavy industries. Q: Lately we are seeing a kind of political uncertainty in the US, especially when the two major political parties are engaged into battle of supremacy? There are indications that Democrats may dismiss most of the economic initiatives of President Donald Trump. Due to political uncertainty, there already is substantial rise of terrorism and incidents like attack on the political opponents etc. Being an expert on market finance, do you think this situation may ultimately discourage foreign investors from investing in the US? A: Not at all… The U.S. is the most competitive economy in the world today, according to the latest annual ranking by the World Economic Forum (WEF). It’s the first time since 2008 that the U.S. has topped the WEF’s list since before the financial crisis in 2008. I only see things getting better at large in the U.S and foreign investors flocking in more than any market in the world. Q: President Donald Trump sees the immigrants [in his words, illegal immigrants] as a burden for the United States. Do you agree with him? A: Illegal immigrants are much more than just a burden to the United States and I totally agree with him. At the federal, state, and local levels, taxpayers shell out approximately $134.9 billion to cover the costs incurred by the presence of more than 12.5 million illegal aliens, and about 4.2 million citizen children of illegal aliens. That amounts to a tax burden of approximately $8,075 per illegal alien family member and a total of $115,894,597,664. The total cost of illegal immigration to U.S. taxpayers is both staggering and crippling. Q: In one of your recent articles, you have said, “All Arab rulers are prepared, if necessary, to murder those who stand in the way of their political ambitions. They much prefer to silence dissidents with patronage and punishment through kangaroo courts, but not one of them will hesitate to send out a hit squad if he thinks his rule depends upon it”? Will you please elaborate it? A: Like it or not, geopolitics is a team sport, and in the Middle East, it’s a team blood sport. Even if MBS [Mohammad Bin Salman] ordered the hit—in fact, especially if he ordered the hit—the Trump administration should allow the Saudi government to complete its own investigation and punish those found responsible, publicly accept those results, and move on with its plans for bringing much-needed peace and stability to the region. With the shellacking his international reputation has taken as a result of the Khashoggi affair, MBS may prove to be an even more loyal ally if the Trump administration stands firm. Feeding him to the wolves will only make them more ravenous. Q: Recep Tayyip Erdoğan clearly is pushing Turkey towards the fate of an Islamist nation. Is this rule a blessings or curse for the Turkish people? A: Erdogan is not that much different than Obama: the government is totally in charge. Of course the name of the religion is different. Let them eat falafel. In Western capitals a decade ago, Turkey’s now-paramount leader, Recep Tayyip Erdogan, held promise as a potential beacon of democracy for a region rife with religious conflict. Turkey was a stalwart NATO ally bridging Europe and the volatile Middle East. As Mr. Erdogan sought to secure a place for his country in the ranks of the European Union, he presented himself as a moderate and modernizing Muslim leader for the post-9/11 age. He catered to perceptions that Turkey was becoming a liberal society governed by tolerance and the rule of law. But that was before Mr. Erdogan began massing supreme powers, and before his brutal crackdown on dissent following an attempted coup two years ago. It was before Turkey descended into a financial crisis delivered in no small measure by his authoritarian proclivities and unorthodox stewardship of the economy. Whatever was left of the notion that Mr. Erdogan was a liberalizing force has been wholly extinguished.